Silverline Designs: Life IS good!! I have been thrilled with my jogging efforts lately...a few of us at work try to head out during our lunch hour. We have a 3km course through the neighbourhood near the hospital that we run...we aim to get out at least twice a week. I only started doing this in May of this year and we have been soooo sporadic, but we are making progress. Only one teeny walk in the middle of the entire 3km last time we went!!! So, to celebrate, I made this card which just happens (wink!) to fit the criteria for the September Home Page contest over at the A muse Addicts forum. The card must have at least 3 of these colors: Swiss Red, Bark (brown), Orange Crush, Palm (green).... AND add glitter to it. Here's to fresh air, exercise and feeling good about yourself!! 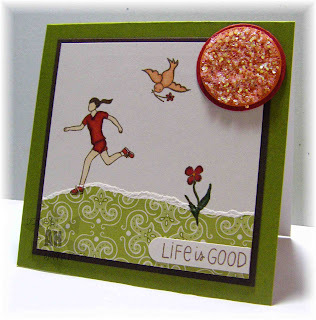 Stamps: A muse (simple wishes, life is good, runner). Ink: Palette Hybrid Burnt Umber. Paper: A muse (palm, green madeira), SU (chocolate chip, only orange, real red, very vanilla). 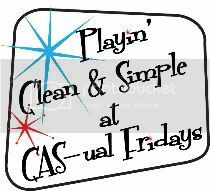 Accessories: SU (chunky glitter, 1 1/4" & 1 3/8" circle punches, word window punch, 2 way glue), copics. fun card...love the madiera green! This card is stunning - love the madeira grass. It has a true "runners" feel to it. Love it!